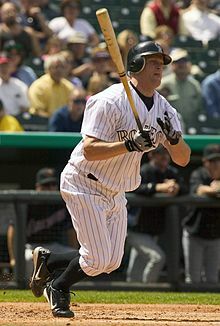 In 2004, Burnitz signed with the Colorado Rockies, and became part of some rare home run displays. On April 27, he, rookie Matt Holliday, and Charles Johnson combined to slug back-to-back-to-back home runs against the Florida Marlins, the sixth such occasion in franchise history. In a May 18 game against the Cincinnati in which he hit two home runs, both were part of back-to-back HR sets with Holliday, making them the first teammates in franchise history to hit back-to-back HR twice in the same game, and the first teammate duo to do so since Mike Cameron and Bret Boone of Seattle Mariners in 2002. In 150 games, he led the Rockies with 37 home runs, hit a career high .283, and was second on the team with 110 RBI. On February 2, 2005, the Cubs signed Burnitz to a one-year contract, the same day Sammy Sosa's trade to the Baltimore Orioles was finalized. He continued to hit well at Wrigley Field with a .258 average, 24 homers and 87 RBI in 160 games with the Cubs. ^ "Matt Holliday stats, video highlights, photos, bio (2004 highlights)". MLB.com. Retrieved September 1, 2014. ^ "Pirates Notebook: Burnitz apologizes for failing to run out grounder". www.post-gazette.com. This page was last edited on 2 November 2018, at 23:41 (UTC).